Coconuts have become increasingly popular in recent years and so have healthy coconut products. One of the best known and most versatile is coconut oil. You can use it to prepare food with, for hair and skin treatments, for oil pulling and even to condition your cutting board. Other popular healthy coconut products are coconut water and coconut milk. 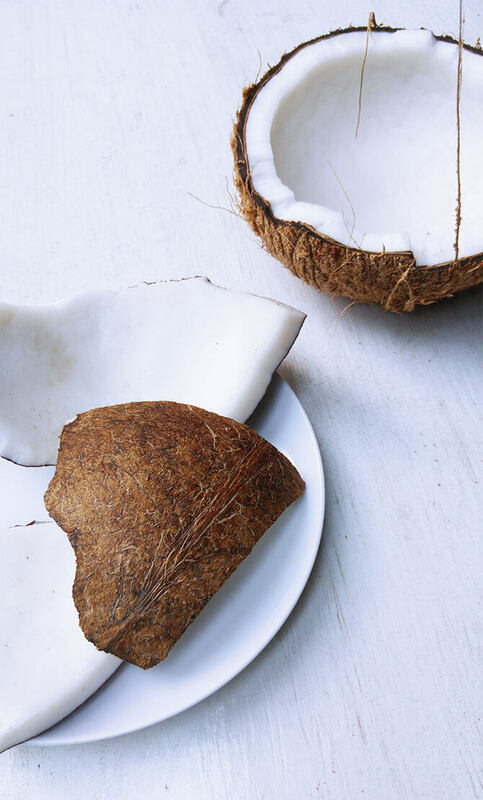 But there are more amazing coconut foods that you don’t want to miss out on! Coconut butter, coconut flour, coconut aminos and coconut yoghurt are some of them. In this article I cover 23 healthy coconut products, explain how you make them and what you can use them for. All of them come from the coconut palm, which is rightly named the tree of life. It provides us with food, shelter and livelihood in so many ways, literally every part of it can be used for something. When you think of coconut palms you probably imagine exotic bounty beaches and lush green rainforests. 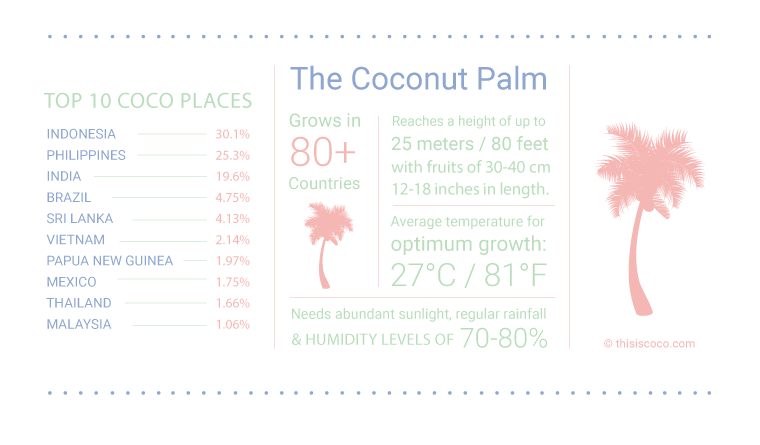 Makes sense because the coconut palm needs a lot of sunshine, regular rainfall and high humidity. This is typically found in the tropics. Initially there were two kinds of coconuts, each with their own DNA. One originated in the area of the Pacific Ocean in countries such as Indonesia, Malaysia and the Philippines. The other originated in the Indian Ocean in countries such as India, Sri Lanka and the Maldives. Coconuts then spread throughout the world, some of them naturally, others by trade and colonization. The coconut palm can grow up to 30 meters / 98 feet tall with fruits of 30-40 cm / 12-18 inches in length. It takes the coconut palm about 6-10 years to grow its first fruit. It can then, under optimal conditions produce up to 100 fruits per year. The growth process from flower to mature coconut takes about 1 year. It can take anywhere between 15-20 years for the palm tree to reach its peak stage of production. Coconuts are in season all year long. Coconuts are some of nature’s most versatile creations. 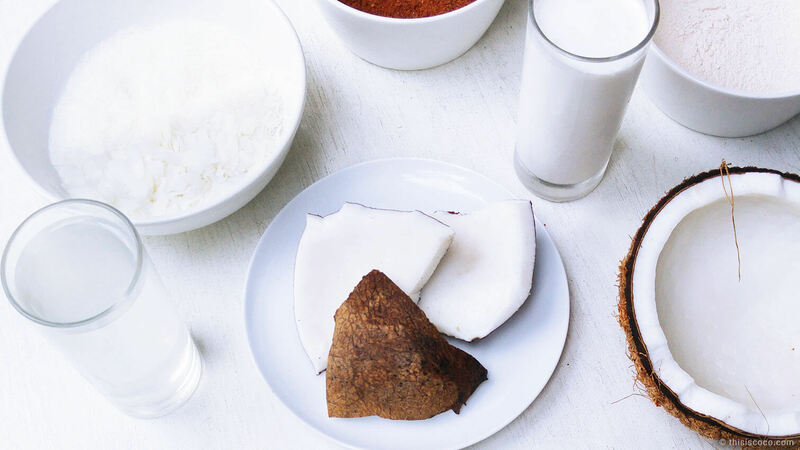 They produce a large variety of coconut products that are both delicious and healthy. Unlike their name suggests, coconuts aren’t nuts. They form part of the drupe family, which are fruits consisting of a fleshy external part with a pit and seed inside. Drupes have three layers: the outer layer, a fleshy middle layer and a hard layer that surrounds the seed. Mangoes, olives, almonds, peaches and cherries are other drupe varieties. This is the clear liquid from young coconuts of between 6-10 months old. Every coconut stage and variety has a different flavor. Usually the older the coconut is, the sweeter the taste. Coconut water is very popular for its hydrating properties. It’s rich in electrolytes, important minerals such as potassium, magnesium and calcium. Water from freshly picked coconuts is of course as good as it gets. If you don’t have access to fresh coconuts, you can buy commercially packaged coconut water. It can still contain many health benefits, it all depends on the production method. Most old coconuts also contain coconut water. You can often drink it and it can be very tasty. But you have to know which ones you can drink. This is because the water in very old coconuts can get acidic which isn’t good. Also, coconut water from young green coconuts is much more nutritious than water from mature coconuts. Coconut water and water grains make a healthy fermented beverage that is rich in good bacteria and enzymes. You might know regular water kefir, but you can also use coconut water instead of regular water to increase the nutritional benefits and taste. There is also coconut milk kefir, which you can read more about further down in this article. Initially, a young coconut doesn’t have any ‘’meat’’ or kernel inside, just water. When it’s about 7 months old it starts to grow soft jelly-like meat. You can scoop it out of the shell and eat it or use it in desserts and other dishes. Some people feed it to their babies as it’s very healthy, easy to eat and babies love it. You can also use young coconut meat to make raw coconut yoghurt. All you need are probiotics and coconut water to help with the fermentation process. When the coconut matures, the young coconut meat becomes thick, solid coconut meat. It’s creamy and healthy snack with a bite. It can be used in granola, fruit salad or by itself. 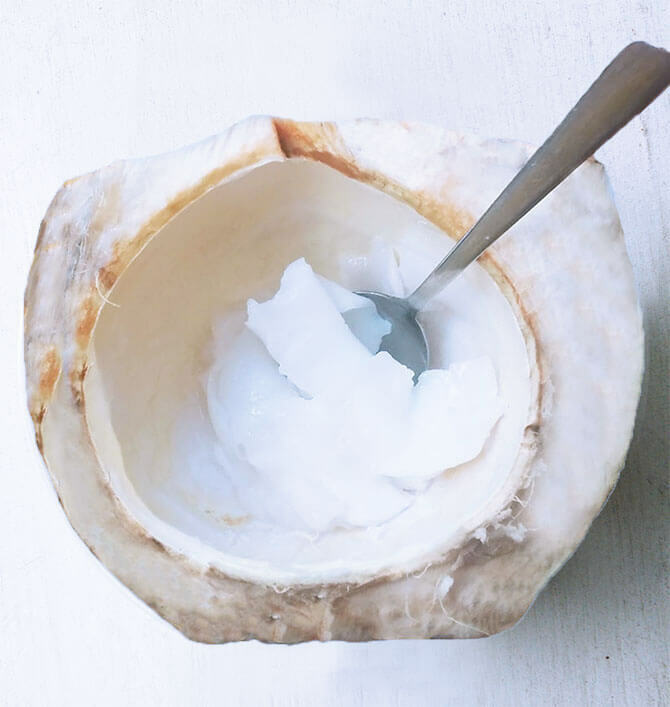 Coconut meat is the base for many healthy coconut products such as coconut milk, coconut oil, shredded coconut, coconut ice-cream, coconut yoghurt, coconut kefir and coconut flour. 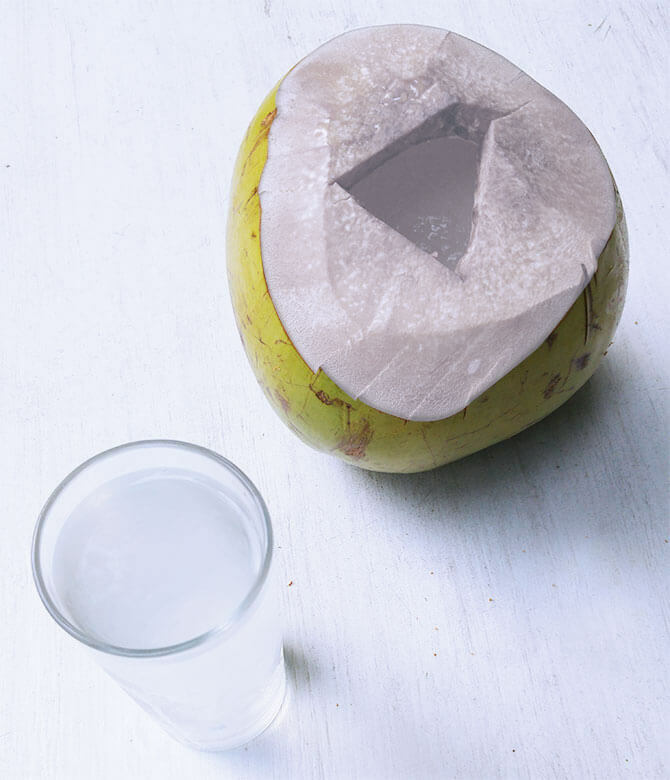 This white liquid isn’t actually found inside the coconut, but is made from grated coconut meat and water. It’s very nutritious and rich in fiber, minerals, vitamins B,C and E as well as healthy fatty acids MCT’s. This plant-based milk has a delicious creamy taste and is great in smoothies, curries, soups, stews, desserts etc. It’s one of the most versatile healthy coconut products and very popular in Asian and Caribbean cuisine. 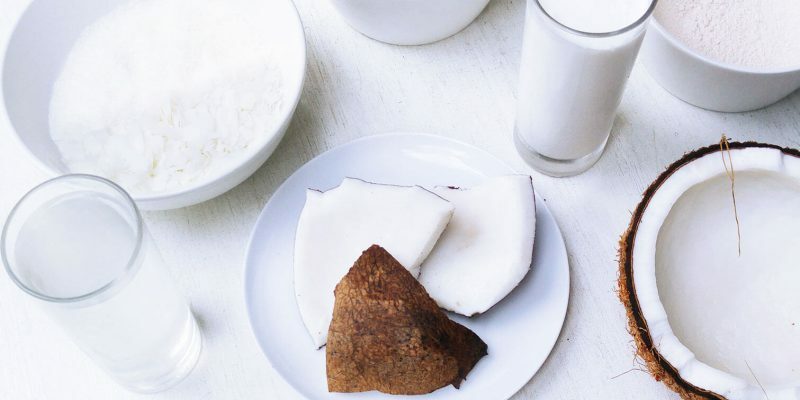 Coconut milk is a common replacement in recipes that traditionally call for cow’s milk. It’s also very popular among vegans and people who follow a dairy-free diet. During production, the liquid separates into a cream that can be skimmed off to make another coconut product: coconut cream. The cream is thicker and creamier than coconut milk, which makes it perfect for recipes that require a rich consistency. Coconut yoghurt is plant-based yoghurt made from coconut milk and probiotics. It has a rich, creamy taste and texture, similar to that of dairy yoghurt, but tastes even better if you ask me! It’s one of the latest healthy coconut products that is growing in popularity. You can find it in health food stores and some of the better supermarkets. 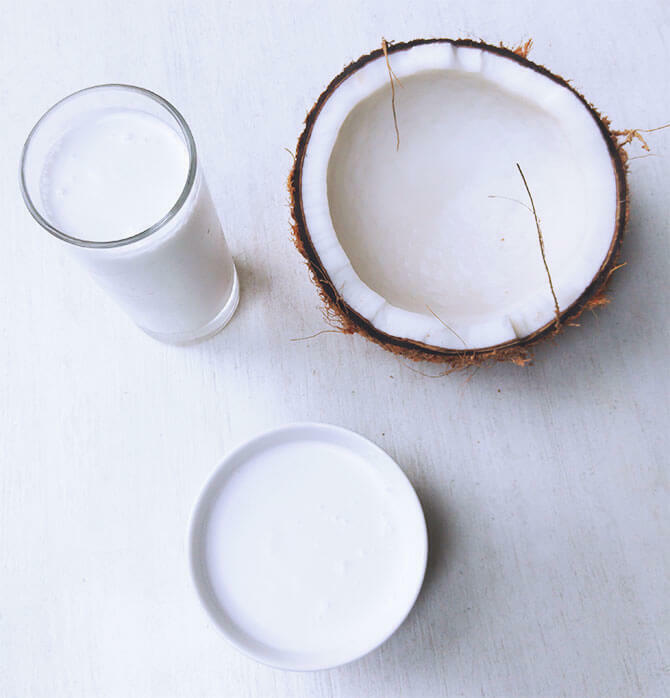 Another way to make coconut yoghurt is with young raw coconut meat, coconut water and probiotics. Kefir is a fermented drink with a tangy taste. It’s traditionally made with cow milk. This probiotic, cultured beverage contains a huge amount of good bacteria that support gut health and our immune system. You can also use coconut milk to make kefir, which makes it even more nutritious. It’s very suitable for those that don’t consume dairy, but still want to get the health benefits of kefir. More about coconut kefir in this article. To make coconut milk kefir you need Tibetan kefir mushrooms, also known as milk kefir grains. Another fermented drink is coconut water kefir, which is similar to regular water kefir. Instead of Tibetan kefir mushrooms, you use water kefir grains. Milk kefir offers even more health benefits than water kefir. This is also the case for the coconut variations. Condensed coconut milk is cooked coconut milk. The evaporation during the cooking process gives it a thick, creamy consistency. Also known as sweetened coconut condensed milk with added sugar. It’s a unique ingredient in fudge, pies, tarts, pudding, ice-cream, dulce de leche, as well as savory dishes and hot or cold drinks. This is a healthier, tastier and vegan-friendly alternative to regular dairy condensed milk. Here is the recipe to make your own sweetened condensed coconut milk. Frozen coconut milk makes a creamy, delicious dairy-free ice-cream. Either as coconut flavor or as a base for other flavors such as chocolate or caramel. Here is how to make traditional Thai coconut ice-cream. This is the thick, creamy part of coconut milk that contains less water than coconut milk. It’s very suitable for desserts and in dishes that require a rich consistency. You can also use it to make dairy-free whipped cream. Coconut cream is sold in a can or small carton, but you can easily convert a can of coconut milk into coconut cream! All you need to do is refrigerate an unopened can of coconut milk overnight. The cold will separate the cream from the liquid and you can then scoop out the thick cream from the top part of the can. Make sure to buy full fat coconut milk and don’t tip or shake the can. Similar in name with the one above, but this is a whole different product. It’s a solid chunk of dehydrated fresh coconut meat. The coconut meat is processed into a cream and then pressed into a plastic wrap. It’s very hard and you need to put some strength to cut it. A small part of it is pure coconut oil that naturally separates from the coconut cream. It melts at high temperatures, so what I usually do is cut it into little chunks and add it to the pot. The taste is extremely rich, so it’s great for recipes that require that. It’s also naturally sweet, although it’s 100% pure coconut, at least that is the product that you should buy. This is one of the most versatile healthy coconut products and probably the best known of them all. 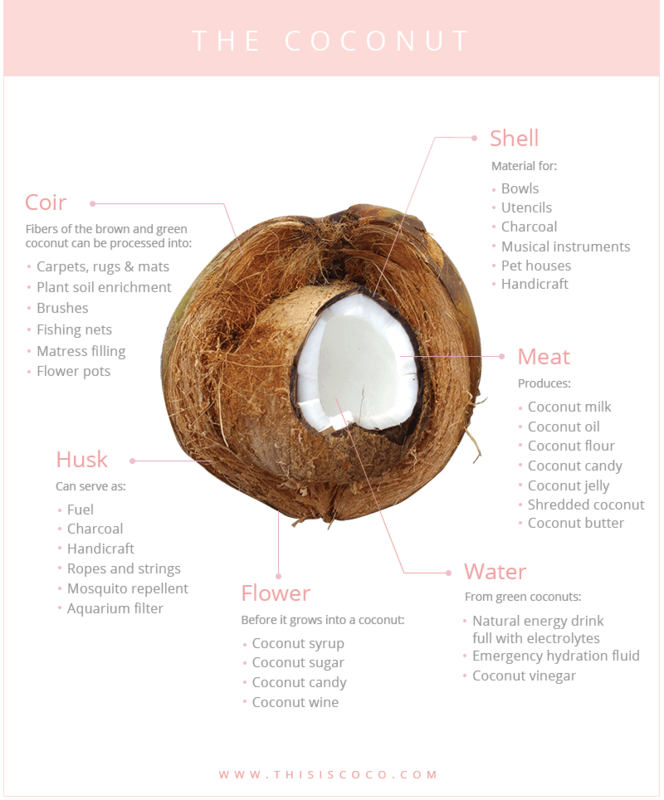 The oil is extracted from fresh or dried coconut meat of coconuts that are between 10-20 months old. Virgin coconut oil contains fresh coconut meat and refined coconut oil is made from dried coconut meat called copra. 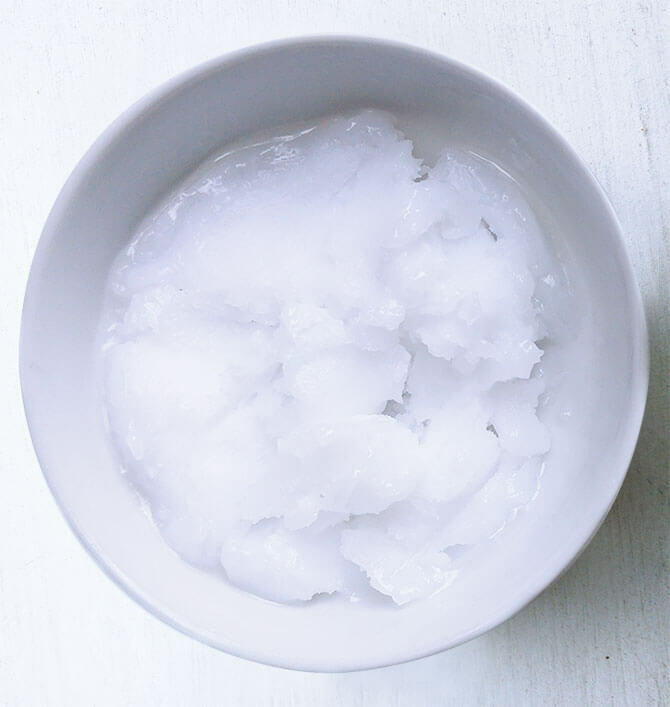 Coconut oil is very suitable for cooking, baking and frying, in desserts and snacks. It compliments both savory and sweet dishes. The high concentration of healthy saturated fats make it the most heat-stable fat for cooking. It has a melting point of 24° C / 76° F.
Coconut oil is also a popular ingredient in beauty products such as soap, moisturizers and shampoo. There are many ways you can use it for your skin, hair, nails and mouth. Read here how to choose the best virgin coconut oil and the best refined coconut oil. This is dehydrated coconut meat and it’s typically used in desserts, baking and fruit salads. Coconut flakes are a tasty, healthy snack on their own or combined with nuts, seed and other fruit. You can buy them as flakes and chips. They also form the base for the next delicious coco ingredient on the list: coconut butter. 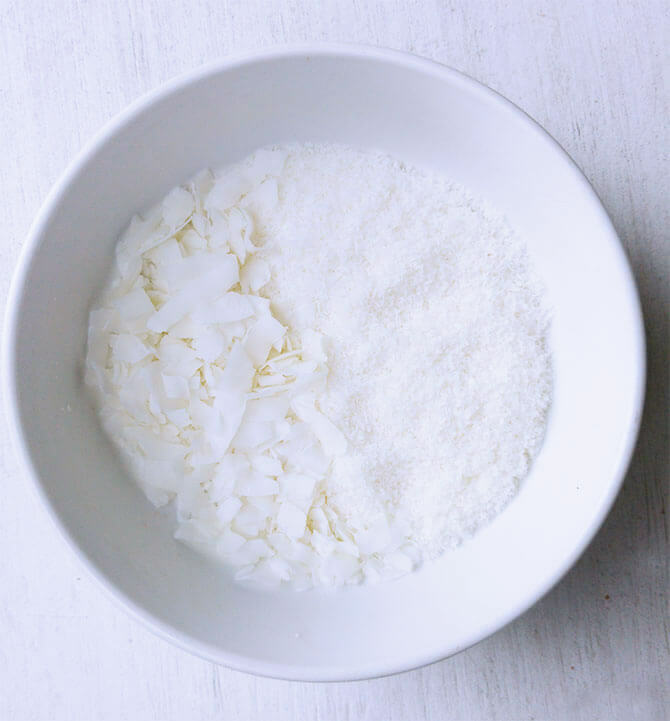 Shredded coconut is processed in a food processor to make a creamy coconut butter. It can be used as a vegan, dairy-free butter replacement, nut-free butter (instead of cashew butter or almond butter), as a base for desserts such as fudge and for frosting. Coconut butter is also known as coconut manna. Dehydrated or air/oven dried ground coconut meat is blended to make flour. 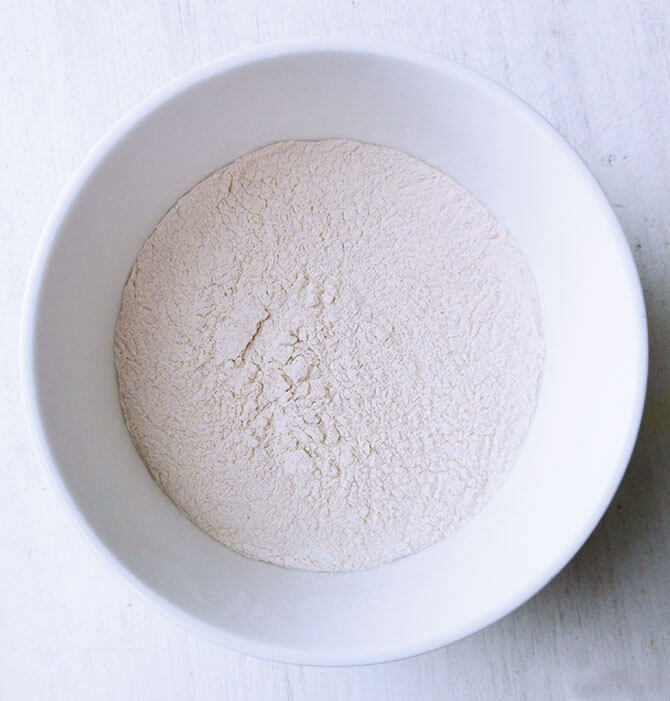 Coconut flour is gluten-free and can replace regular wheat and other grain flours in most recipes. It has a mildly sweet taste, but it’s not dominant, so it’s also suitable in savory dishes. Coconut flour has the highest fiber content of all flours: 48%. It’s low in carbohydrates and is a favorite in Paleo cooking. Because it’s so rich in fiber it absorbs more liquid. This means that you will need to use a different ratio than you would with regular flour: roughly 1/4 cup of coconut flour for 1 cup of regular flour. Experiment with it to see what works best for you. Coconut meat is air-dried and ground. It is then caramelized with coconut nectar and can be used in desserts, in baking or by itself. This is juice extracted from the flower buds of the coconut palm. You heat it to evaporate the liquid until it transforms into a syrup consistency. It can be used as a sweetener, to prepare desserts or process it further to make coconut sugar. Once coconut syrup becomes very sticky you turn off the heat and stir it until it becomes granular. 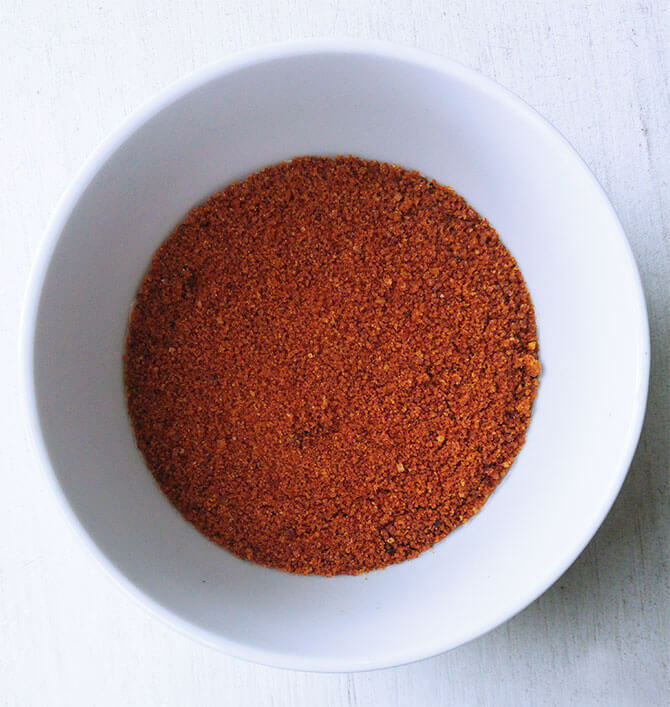 Coconut sugar or coconut palm sugar has become a very popular healthier substitute for refined white sugar. Its glycemic index of 35 is lower than that of regular sugar and most other sweeteners. Besides that it contains minerals such as iron, calcium, zinc, magnesium and potassium, different amino acids and vitamins B.
Coconut sugar has a rich taste with a hint of caramel. It’s not to be confused with palm sugar. Coconut syrup forms the base for a variety of coconut candy. You’ll find different types in various parts of the world. A light alcoholic beverage made from coconut syrup, which is very popular in different parts of Asia, South America, Africa and the Caribbean. The sap of the coconut palm blossoms is the base for this sweet, rich beverage. The juice can be further processed into coconut vinegar or nectar and coconut aminos. When you ferment coconut sap juice and add salt to it, you get a low-sodium soy sauce alternative. The taste is slightly sweet, so it’s a bit like ketjap manis or teriyaki sauce, but more liquid. It’s very suitable for people with soy or gluten sensitivities, anyone who wants to avoid soy or keep the sodium intake low. It contains 70% less sodium compared to soy sauce. The last on the list of healthy coconut products is coconut vinegar. It’s made from fermented coconut water from young coconuts or fermented coconut palm sap. Coconut vinegar is a popular ingredient in Asian cuisines such as the Philippines, India and Sri Lanka. It has an acidic taste and contains many nutrients. The vinegar is rich in potassium and also contains other minerals including iron, magnesium, zinc, copper and manganese. It contains the 9 essential amino acids, which are used by the body as protein building blocks, plus other 8 other amino acids. Coconut vinegar is suitable for diabetics and people who watch their sugar intake. It has a low glycemic index of 35. Quite impressive right? And this is only one side of coconut’s amazing versatility. The coconut shell, husk, coir, leaves, trunks and roots are versatile materials. You can make brushes, ropes, carpets, fishing nets, fuel, charcoal, mattress filling, musical instruments and much more from them. I hope you enjoyed the healthy coconut products guide. If you feel inspired to make your own coco creations, take a look at these recipes made with coconut products.